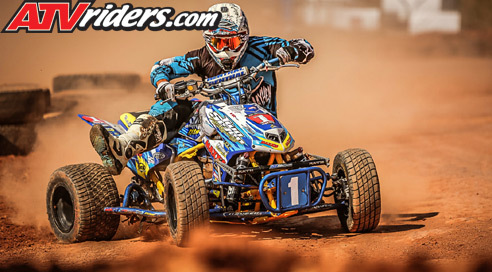 Wadesboro, NC – The 2015 season of the AMA Extreme Dirt Track ATV Racing series kicked off this past weekend at a brand-new facility located in the Western part of North Carolina, in the small town of Wadesboro. The track; Perimeter Park Motorsports is a new facility brought together by a husband and wife duo, Ashlee and Nolan Scarborough, who have a passion for racing and put together a beautiful facility for the opening double-header of the series. The weather itself, was even nice for the entire weekend and allowed the racing action to heat up immensely with temps nearing ninety degrees with sunny conditions! 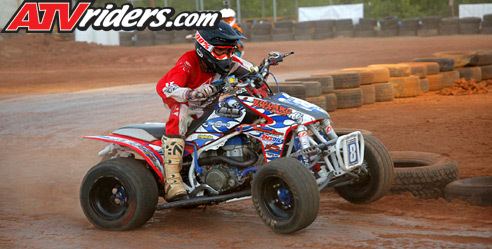 2014 EDT Racing Pro ATV Championship, Two Se7en Motorsport’s Brad Riley, was rocking a red number plate this weekend with the number one on it. He had to do battle with thirteen other pro class racers throughout the day, but ended up coming away with the win in both the Pro and the Pro-Am classes to hold onto his red plate. MAXXIS / PEP / Houser Racing’s Brad Riley was off to a killer start of the Pro main event as he dropped the lever on his Rekluse clutch and got out front with a big holeshot! Riley was trailed closely by Chuckie Creech and Michael Houghton who were sitting in second and third place. By the end of lap one, Ace had moved up into third place and the chase was on for Riley as he had to set his own pace out front. 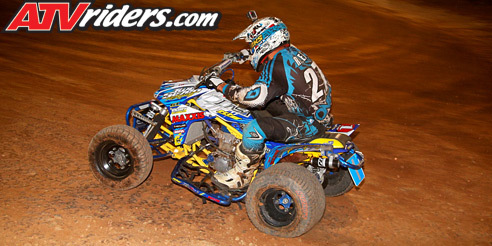 Riley is no spring-chicken of this sport and he knew the North Carolina red clay like the back of his hand. He got into a comfortable rhythm and began to put smooth laps together, even over the increasingly rough surface. Riley came away with the number one podium position and was happy on the top of the box. “Everything came together for me tonight and I’ve been working on my starts a lot since early last season and I was able to get out front early which was key as this track is fairly one-lined. The big berm area was a lot of fun and I was able to carry some speed through that section and made up a good size gap on the guys behind me. 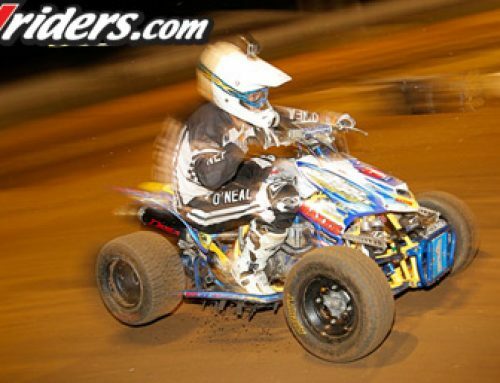 My MAXXIS Tires and DASA motor were putting the power to the ground through the PEP suspension and I was really hooked up and hitting my marks, it was a great race,” said Riley happily. 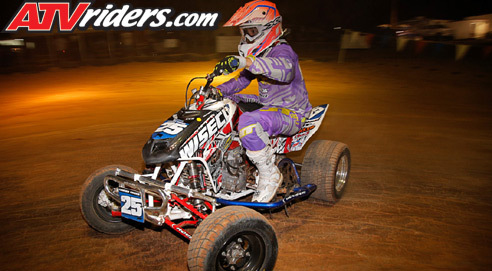 CCR Swaybars / WISECO / Houser Racing’s Chuckie Creech got himself off to a great start as well. 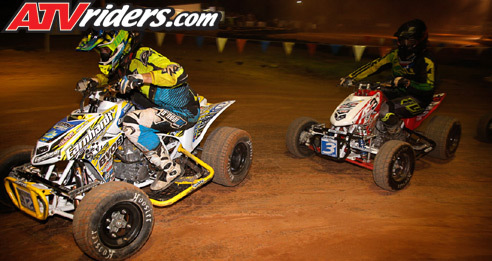 Creech launched off the line and trailed Riley instantly into the holeshot corner in second place. At this point, Creech knew he had not only Riley to beat to the podium plateau, but had to also defend his position from the onset of the other racers behind him. Creech did was he does best however, and rode very clean laps, remaining mistake free for all twenty laps to lock up a second place ride for himself for the first round of the season. “I had a great start to that race and Eric from Close Encounter Whitetails came down and grooved about twelve tires for me in this hot heat and if it wasn’t for that I might not of been able to hang on for those twenty laps so I gotta thank him. The WISECO brakes kept me coming into the tight corners nice and smooth and these new Elka shocks really were great over the rough stuff on the track. They are brand new and I’m getting used to them and dialing them in. I’m happy with the way this got started off and I think we can continue to run right up front for the rest of the season,” said Creech on the podium. Tru-Way Racing / Walsh Racecraft / PEP’s Brian Ace also got off to a good start after coming out of the holeshot with a ton of a speed and sliding around the first bend alongside of Michael Houghton. Ace was able to quickly move into third place by the completion of lap number one and then began to work his way toward Creech who was in second place. Ace kept a clear mind for the remaining nineteen laps and pushed his bike to the limits without fail to end up in third place on the podium at the opening round. “All I had to change from the Pro-Am race to the Pro was just a set of new Hoosier tires. The bike was running excellent and it was dialed in for the track perfectly. I need to work on my endurance a bit and my training but other than that I’m really excited about being up here. The Frailey family, my Dad, and everyone who comes to these races with us, including out sponsors, I can’t thank enough. It’s a huge team effort and we made it up on the box so I’m super pumped with that,” said Ace excitedly on the podium. Earnhardt Racing’s Michael Houghton got off to a great start in third place out of the holeshot but slid back to fourth place where he and B&B Racing’s Aaron Medlin battled for the remainder of the race. Houghton kept his composure however and came away with fourth place leaving Medlin to round out the top five. The Pro-Am class was also a great race to watch and with only seven riders on the class, it was face-paced and the action unfolded quickly! Two Se7en Motorsports / Victory Motorsports / DASA’s Brad Riley had a very clear mission set in his mind for the opening round of the 2015 season and that was to win. Riley didn’t snag the holeshot this time however but he was still near the front of the pack in second place behind Brian Ace. Riley set his sights on getting around Ace and made a pass stick by the midway point of the race. After the pass, Riley kept on the throttle and never looked back for the remainder of the fifteen lap main event. Riley brought home the win in the Pro-Am class sealing the deal on two first place finishes for the first round of the series. WISECO / RAGE / Elka Suspension’s Chuckie Creech got off to a third place position during the holeshot but kept on the heels of Riley who was on a mission to the front. Creech had to battle with Ace who initially grabbed the holeshot but was able to get around him as well. Creech made the pass stick and continued on the rest of the race in second place, chasing down Riley but ran out of laps before being able to advance any further. 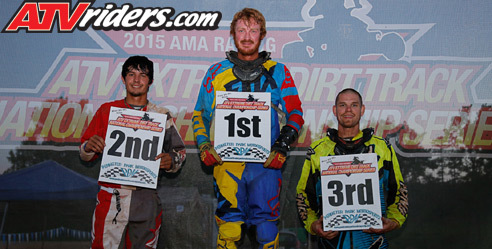 Creech now has a solid start to his season in the Pro-Am class as well. RATH / ESJ Graphics / Doonan Racing’s Brian Ace came out swinging for the fences for the Pro-Am class and dropped the hammer to snag a big holeshot. Ace got off to a comfortable lead at first but it wasn’t long until he was under attack from a hard charging Riley who was set out to take over the lead. Ace battled as hard as he could with Riley but fell back to second place and then also succumbed to the pressure that Creech was applying as well. Ace had the podium in his sights however and kept up his pace to round out the Pro-Am podium in third place. Fourth place and fifth place were held by the two Garretts, Garrett Keister and Garrett Ryckman. Keister coming off a championship in the Pro-Am unlimited class, was trying to make a name for himself in the Pro ranks and came away with a solid fourth place while Ryckman trailed closely in fifth place to round out the top five. 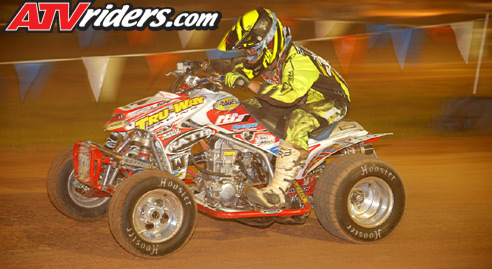 The Pro-Am unlimited class had an equal amount of riders as the Pro class and with the opportunity to run a bigger engine or modified ATV, the racing action would be fast and furious! Wolff Motorsports / DASA / Rath Racing’s Nathan Wolff was a prime candidate for the top of the podium as he came out of the holeshot neat the front of the pack with a good start. Wolff trailed Michael Houghton who took the holeshot and would not let Houghton out of his sights for the first few laps as he sized him up and read his lines. Wolff finally snuck in a very quick pass around the one-eighty bermed corner as Houghton went high Wolff slid in on the lower side and locked in the first place position. Wolff never looked back after taking over the lead and remained the lead until the checkered flag flew over the fifteen-lap main event. Big Dawg / B&B Motorsports / Canup Trucking’s Aaron Medlin has been coming on strong since last season and got off to a good start coming out the holeshot in fourth place. Medlin had to get around CJ Robson who was in third place and a fellow North Carolina native who he has battled with before. Medlin snuck his Honda around Robson to take over the position but then had to battle with Houghton who had second place locked in. Medlin kept his persistency at one hundred percent when it came to utilizing the big berm in the center of the track. This allowed him to gain ground on Houghton and eventually put on a pass before the race was over, securing a second place podium finish for himself. This is one of the best finishes for Medlin in his Pro career and is a great start to his season. 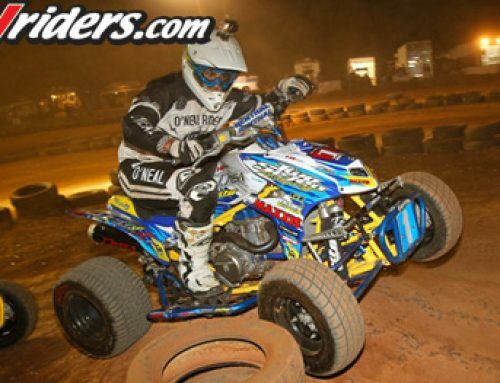 Earnhardt Racing / TRE / Rath Racing’s Michael Houghton won the opening round of the 2014 season in the Unlimited class and was off to a great start for this round as well with a big holeshot. However, Houghton is on a completely new machine and program this year along with having some very stiff competition to go up against. Houghton pushed on after the holeshot and battled with Wolff and Medlin but eventually dropped back to third place by the end of the fifteen laps. Nevertheless, a great ride and a great starting point to his season. CJ Robson got off to a great start and battled with the front of the pack for some time but later dropped back securing fourth place for himself, a great run considering it was his first-ever race in the Pro ranks. Fifth place was rounded out by Josh Hibdon of H&H Extreme who has always had bad luck with North Carolina dirt but made a great run for himself with a solid top five finish. 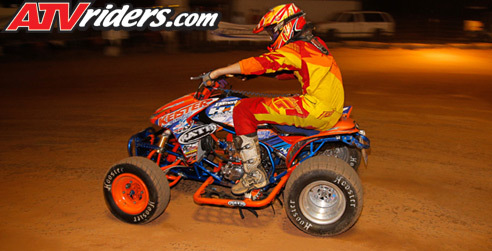 The next round of the Extreme Dirt Track ATV racing series was the very next day at Perimeter Park Motorsports and we will be doing a full write up covering that round, along with photos and results. 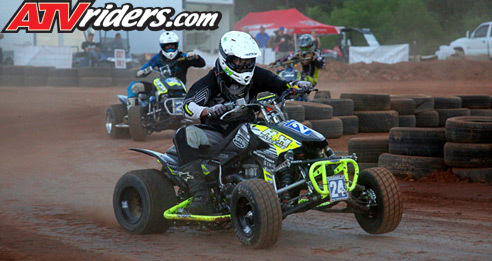 Check back here on ATVRiders.com to see how the racing action unfolded the next day for the second round of competition!